" A lot of people search out special records. I search out special grooves, small bits that fit snug together, regardless of where or what the music is - essentially trying to piece things into an interesting sonic palette . " For over a decade, veteran DJ, label-head and producer, Jeremy P. Caulfield has been at the forefront of contemporary techno. His Dumb Unit label and his acclaimed DJ style see him crossing the globe to deliver his deep emotional techno and rewired house to enthusiastic audiences. 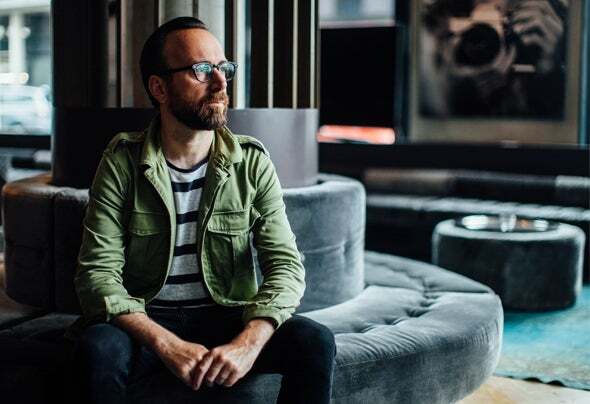 From the early days of throwing parties in Toronto to his current role in the Berlin's electronic music community, Jeremy has always flown the flag for an exciting yet distinctive range of musical styles. Blending sound design with stripped back grooves, his early releases on labels including Trapez, WMF and of course, Dumb-Unit established him as one of the most unique voices in the early '00s electronic scene. Today he continues to refine his sound with a series of killer cuts and remixes while his Dumb Unit imprint remains an essential outlet for fans of sophisticated dance floor music. Focusing on a dynamic family of active artists (Cesare vs Disorder, Seph, Maetrik, Elon & Pherox) Dumb Unit's sound is forever being shaped by this important core group. Additionally, the many new faces appearing (Walker and Agaric, Pablo Denegri) continue to help the label evolve into uncharted territories. Despite a non-stop DJ schedule, Jeremy still attends to his residency at Berlin's famous Watergate providing an outlet for his diverse styles. These lengthy sets (sometimes 6 hours or more) allow him to showcase his most prized musical picks to an international crowd on some of the world’s best sound systems. Combining decades of experience with an insatiable drive for the most exciting new sounds, Jeremy P. Caulfield continues to explore the ins and outs of modern techno. Free from the trends and hype that clog much of contemporary club culture, he delves deep into the groove on his own terms, in his own way. The current climate may be tougher than ever for underground independent music, but Jeremy's prospects are definitely future positive. Big Weekender Chart . . .